Did you tune in to the 84th Academy Awards show last night? 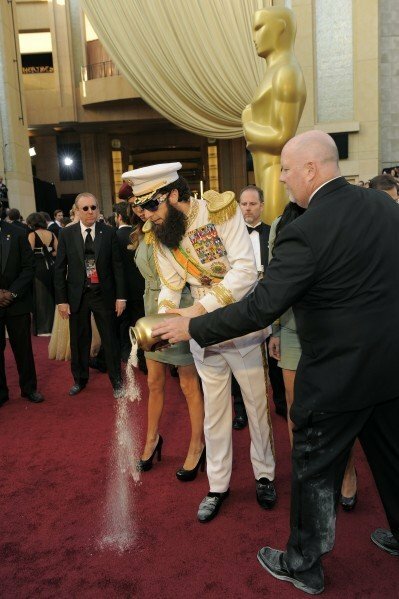 If you turned on your television a little early, you may have caught comedian Sacha Baron Cohen (Borat) dressed as the 'The Dictator', a character from his upcoming movie. The internet was buzzing with Cohen tweets and stories last night after Cohen dumped a fake urn of Kim Jong Il's ashes on E! reporter Ryan Seacrest during a red carpet interview. Something tells me Seacrest wasn't very happy to have the ashes, which turned out to be pancake mix, dumped all over his tuxedo - but you never know what is going to happen when Cohen comes around. What do you think about his comedy? Does he go to far?